If you are looking for information on the Jody Maronis Sausage Kingdom franchise business opportunity, Jody Maronis Sausage franchises or Jody Maronis franchising, then you have come to the right place. Jody is looking for the strong and the loud. The dreamers who have what it takes to sit on the throne of a Jody Maroni's Sausage Kingdom. In the tradition of the carnival barker, our franchisees must have the gift of gab and the knowledge, experience and desire to hawk the world's greatest sausage sandwiches and hot dogs. 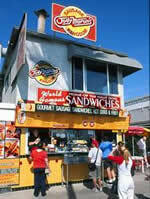 All of our unique gourmet sausages are individually created by Jody Maroni, the Sausage King of Venice Beach. They are always grilled and served on a fresh-baked onion roll and smothered in sautéed onions and peppers. Along with our World Famous Sausages, our menu includes other American classics including our Coney Island-style All-Beef Hot Dog. The weak, the timid, the uninspired need not apply. In 1979, Jody Maroni reinvented the sausage with his own brand of gourmet flavors. Jody put an end to mystery meat by grinding his sausage coarsely so that customers could actually see the natural ingredients such as apples, oranges, cilantro, basil or sun dried tomatoes among others. His "entrees in a casing" have been acclaimed worldwide as the best of their kind. He uses only the finest cuts of meat and poultry and highest quality ingredients to create his chicken, turkey and pork sausages, which are also lower in fat content and higher in flavor than most sausages. Customers can choose from more than a dozen different award-winning sausages, hot, mild, exotic or traditional. 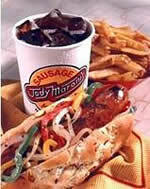 Each sausage is always grilled and served on a fresh-baked onion roll and smothered in onions and peppers. His specially made all-beef hot dog has the snap that comes with a natural casing. Hand-cut French Fries made from real Kennebec Potatoes and Fresh-Squeezed Lemonade complete the always fresh and hearty menu. Value Added sandwich with broad-based, multi-ethnic, genderless and ageless appeal. The All-American Hot Dog: 20 billion hot dogs consumed in 1999.